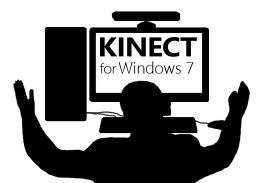 This article describes both the implementation of an input provider, based on the Kinect for Windows SDK v1.0 and the algorithm of hand detection. The input provider sends the coordinates to the windows driver using a clustering hand detection algorithm, which analyzes data in depth at a distance between 800 mm and 1100 mm. The driver sends the data to a virtual Human Interface Driver that translates the “touch messages”. This input providers allows us to use any application (past and future) that works on touch devices. The developer can use this type of software to do also different applications like for example home automation applications.